After 14 and a half months on the circuit, it was time to divide winners from losers. Those two qualification berths which had been at stake for well over a year were within grasp to no less than four out of the five Group 3 contestants, and these four were coming together in an exciting final showdown. The Soviet Union had moved their qualification circus away from the bustling big cities of Moscow and Kiev, and Crimean in-land city Simferopol had been chosen to stage their clash with Turkey. This had seemed a kind decision even to travelling fans, as this was geographically closer to Turkey than the other two. Was it an easier place to get to, though? Difficult to say. Hard facts told their story: A draw would be sufficient for the home side to win the group. However, defeat, by any score, would see Turkey jump ahead of them on goal difference. Still, the Soviets did seem quite certain to qualify, barring a huge win (by five clear goals or more) in the other game (in a hypothetical scenario where Turkey won by the odd goal). It was unlikely that they'd want to sign off with anything other than a win, though, and on home soil, the USSR were rarely in the mood for sharing. For Turkey, a tied game would suffice as long as there was no winner in the other match. Defeat meant they were out of contention. This set of fixtures took place only a few days after the massive historical events in East Germany, where the infamous wall that separated East from West in Berlin had cracked open. Could this somehow influence proceedings? Kick-off time was the same for both of the afternoon and evening's matches (two hours' difference between Moscow and Vienna). No doubt would the two benches follow closely events in Vienna simultaneously. A three game winless qualification streak had seen the other teams gain ground on the Soviet Union, and now Valery Lobanovsky needed to get a result in their final qualifier against a Turkish side which had given more than just a decent account of themselves. Sure, the USSR were favourites, predominantly due to home advantage, but also due to the fact that they were a major force in international football, something which could not be said for their opponents. Yet, Lobanovsky could take absolutely nothing for granted, and he needed to summon his finest men for this crucial clash. Rinat Dasayev had not been eligible for selection for either of the Soviets' previous two qualifiers, as he'd been busy with club football in Spain. Now, well established in Sevilla, the Soviet team captain was back in the squad, something which surely would relegate Viktor Chanov, who had deputised for the last two qualifiers, to the bench. Lobanovsky had not been highly enterprising or sprung any great tactical surprises during a somewhat tame qualification. They had been playing in their 4-4-2/4-5-1 formation throughout, and it was not as if they were likely to throw these principles over board for such a vital fixture. 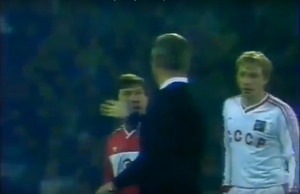 They would have to make do without two of the manager's pupils in Kiev: Both full-back/midfielder Vladimir Bessonov and central defender Oleg Kuznetsov had been cautioned during their 2-1 loss in East Germany, and were subsequently ineligible for this tie through suspension as they'd both accumulated two yellows. Another highly noticeable absentee from the matchday squad of 16 was Juventus midfielder Sergey Aleinikov. He had played the full 90 minutes in Karl-Marx-Stadt, but only been a substitute during the 0-0 in Austria. The stylish defensive midfielder must have been unavailable due to injury, as he had not featured in club matches just prior to and just after this international (Juventus had lost 3-2 at AC Milan on Nov 4 and would draw 2-2 at Udinese on Nov 18), and he was a regular in the Juventus team which later that season would go on and claim the UEFA Cup. His team mate in Italy, Aleksandr Zavarov, was indeed present, and the attacking midfielder was one of three Soviet players who had started all of their previous seven qualifiers. The two others were Gennady Litovchenko and Oleg Protasov. The four departures from the squad since East Germany had been (goalkeeper) Dmitry Kharin, Kuznetsov, Bessonov and Aleinikov. Added to this squad had been Dasayev, 23 year old Valdas Ivanauskas (who had featured during the 2-0 home win against Austria) of Žalgiris Vilnius, Vladimir Tatarchuk, a 23 year old from CSKA Moscow, and like Ivanauskas also a midfielder, as well as Spartak Moscow's own talisman Fedor Cherenkov, who had been let out of the squad last time around after starting the game in Vienna. Turkey had been highly impressive three weeks earlier during their 3-0 dismantling of Austria at home in Istanbul. However, they had been an unpredictable force during the qualification, where they'd shown their capability in three impressive wins, but they'd also failed to take more than a point from possible four over the two meetings with Iceland. That solid win against the Austrians had come at a high price, as no less than three of their key players had been booked during the game, rendering them ineligible here in Simferopol through suspension for having collected two yellows each. They were captain and central defender Cüneyt Tanman as well as midfielders Ünal Karaman and Uğur Tütüneker. Manager Tınaz Tırpan knew he would have a massive job on his hands to find the right replacements for either. In particular Cüneyt and Ünal would be big losses. These three were the only absentees from the matchday squad of 16 since the game against the Austrians, and brought into the squad for the trio were defender Recep Çetin, returning from his one game suspension, and attacking midfielders Hakan Tecimer, who had played the full 90 during the 2-1 defeat in Reykjavik, and Zeki Önatlı, who had been in the squad for their first two qualifiers, but not appeared. Tınaz had shown a lot of tactical awareness so far in their qualification, where he had altered their formation according to opponent and venue. What did he have in store for this match, arguably their biggest in many, many years of international football? He was not in the same position as his counterpart Lobanovsky in that he could pick from a vast pool of high-calibre players, so the loss of three key performers would surely inflict massively on their preparations. Last time around, star poacher Tanju Çolak had got a few minutes towards the end after a lengthy injury lay-off, and there were still some doubts as to whether he would be capable of playing to his highest level. And who did the manager have in mind for the captaincy with ever-present Cüneyt out? On the topic of ever-presents: Turkey had four so far. They were defenders Cüneyt, Gökhan and Semih, as well as midfielder Ünal. These four had all completed the full 90 on each of those seven earlier occasions. The Soviet Union were hardly a favourite opponent for Turkey, whose record against this evening's hosts read 2-0-11. The reverse fixture in Istanbul had seen the Soviets dominate, and Turkey had had goalkeeper Engin to thank for a few saves to keep the score down, with the visitors winning 1-0 on that occasion. Prior to that they'd met in qualification for the 1982 World Cup, when the Soviets had again been very strong, securing two wins with a 7-0 aggregate score. Turkey had last defeated the USSR during a qualifier for the 1976 European Championships at home in Izmir by the score of 1-0. This had happened just shy of 14 years earlier. Experienced West German official Dieter Pauly, 47 years old, had been put responsible for the game. This was Pauly's 11th match on the international stage, where he had made his debut back in December 1982, when he had overseen a 6-0 European Championships qualifier away win for the Netherlands in Malta. He had earlier during the ongoing qualification been officiating in Belfast for the Group 6 clash between Northern Ireland and Spain (0-2). His most recent game at this level had been Denmark's impressive 6-0 trouncing of neighbours and main rivals Sweden in a June friendly. Mr Pauly had been given the fine honour of representing his country on home soil during the 1988 European Championships, where he had indeed been the man in black for the Soviets' excellent 1-0 group stage win against their later final nemesis Netherlands. Seven of the 13 players which had been in action for the USSR on that occasion in Cologne were also in today's matchday squad of 16. The pitch appeared to have taken a whole lot of rain recently. However, video material from the game is of poor quality, and so it is even difficult to say whether the rain's still ongoing or not. With the two teams out onto the pitch, both managers' selections become available to the public eye, and there does seem to be something of a surprise inclusion in the home side's starting eleven through Dinamo Kiev winger Ivan Yaremchuk. The 27 year old, winning his twelvth cap, is capable of playing along either flank, so it remains to be seen on which side of the pitch he will line up. 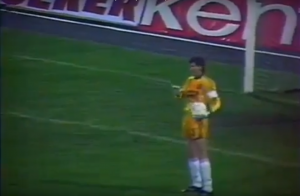 Other than that, it appears to be business as usual for the Soviets, with the captain's armband back around returning goalkeeper Rinat Dasayev's upper arm. For the visitors, there had been a number of enforced changes due to the three suspensions which they'd collected during that excellent 3-0 home win against Austria. The usual right-back, Recep, was included in the eleven, and so it remained a bit of a mystery whether he or his replacement last time around, Rıza, would take the full-back sloth. Young Fenerbahçe forward Hakan Tecimer was also back in the starting selection, having been left out of the squad for the Austria match. He'd played up front in Iceland. The third player to come into the side from their last game was Trabzonspor stalwart Kemal Serdar, who most likely would replace captain Cüneyt Tanman at centre-half. Rıdvan Dilmen had taken over the captaincy. The two starting elevens also suggested ideas about the respective formations. However, there was a chance of mixing things up for the hosts, where 4-5-1/4-3-3 and 4-4-2 remained the most likely options, whilst Tınaz had changed his numbers combinations around during the entire qualification according to the strengths of the opponent. This may not always have been seen as a strong point, but in their case, the manager had been able to use it to their advantage. In Hakan, Rıdvan and Feyyaz they seemed to have three strikers from the off, so pre-match indications suggested that Turkey would try to attack the Soviets. Bold or foolish against a side boasting a 16-2-0 home record in qualifications matches throughout the 1980s, and who had indeed never lost a home qualifying tie for the European Championships or the World Cup (45-6-0)? This stat truly reveals the size of the task ahead of Turkey. The hosts kicked the game into life through Oleg Protasov and Aleksandr Zavarov. The Soviets had looked a tail-heavy outfit of late, something which had not gone unnoticed with manager Lobanovsky (nor his critics). We are told early in the game by commentator Vladimir Pereturin that Aleinikov is sick, and perhaps was his leave a blessing in disguise? A central midfield with him and Mikhailichenko, as well as the supposedly attacking Zavarov, had often been too pedestrian, and now they could call upon different characteristics for the various midfield roles, which had even seemed to be modified by the management. It is as if this could be seen even in the early exchanges, despite the lack of any goalmouth action. Whereas one could've had the impression earlier that the Soviets had been playing with the handbreak on, they now seemed a whole lot lighter in their spring, as they stroked the ball around confidently within their team. The Turkish needed to tread water early on in order to instill some confidence into their side. The three suspensions which had robbed them of key players had taken Tınaz back to the drawing board, and the tinkerman had produced what he thought was a fitting eleven in the circumstances. Proverbial sayings would've claimed that "Turkey had to attack from the off", something which the shrewd manager knew was far from true, even if they most likely would need to win the tie in order to progress to the World Cup. In fact, a Turkish win would almost guarantee both of these to win through to Italia '90, something which could've boded for a 'fixed' outcome. At least in theory. A look at the hosts revealed that they were indeed in a much more attacking outline right from the start, with Igor Dobrovolsky coming into a central attacking midfield role, or at least as an inside left ahead of the somewhat deeper lying Aleksey Mikhailichenko, with the ingenious Aleksandr Zavarov across from Dobrovolsky as the inside right man in their attacking 4-5-1 formation. What was worth noting from this highly skillful trio was that neither was rooted to their position, especially with Mikhailichenko giving far from a conventional, defensive-minded interpretation of his alledgedly deeper role. All three would constantly fluctuate, rotating, showing flexibility, something which one had come to expect from a tactically advanced Lobanovsky outfit. However, their three preceeding qualifiers had all been drab affairs, and so any neutral wishing for an open, enterprising affair would be hoping that they could rediscover some of the quality which they had shown during the 1-0 win in Istanbul during the opposite fixture. 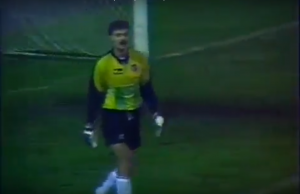 Despite Rinat Dasayev not having had the easiest of 1989 abroad in Spain, having their talismanic goalkeeper back between the posts would surely have meant a lot to the rest of the team. His deputee Viktor Chanov had performed eratically during that 2-1 loss in Karl-Marx-Stadt, and so seeing the captain's armband back on the upper arm of Dasayev would've soothed some Soviet fans' nerves. He was perhaps not considered the world great which he was earlier, but aged 32, no age for a fine goalkeeper, Dasayev for sure still had the know-how and ability to spread confidence right through the rest of the team. At the back, the Soviets had been without influental full-back Anatoly Demyanenko due to a broken ankle for most of the qualification. Being a powerful, attacking defender, he had not been an easy player to replace, and the Soviets had indeed even seen some lack of form from another trusted defender, Vladimir Bessonov, cause further defensive full-back rotating from the management. The energetic Oleg Luzhny had sprung to life and seized on his earlier opportunities during the qualification, even if said Bessonov had done well recently. However, the team as a unit had failed to gel, in particular inside the opposition's half, and so Lobanovsky had been pleased that Bessonov's suspension had given him the opportunity to recall Luzhny for the right-back berth. He was a much different player from the far heavier Sergey Gorlukovich who played opposite of him, at left-back. The latter was so sound defensively, but he had not offered much going forward. This had indeed contributed to the lack of their attacking spark, especially as Gorlukovich had had a not too typical left winger ahead of him in Dobrovolsky for most of the qualification. As libero, Vagiz Khidiatullin remained undisputable as long as he was available for selection. He had missed three matches in the qualification through injury, but he was the natural choice as the spare man at the back once again. On this occasion, though, he had to make do without his usual central-defensive partner-in-crime, Oleg Kuznetsov. The latter was banned after picking up his second booking of the qualification during the defeat in East Germany, and so the fine Andrey Zygmantovich was finally given his second appearance of the campaign. So accomplished on the ball, Zygmantovich was probably a more natural fit in the libero role, but the way Lobanovsky usually set his teams up to play, with a lot of attacking responsibility even being given to the "man-marker", the Dinamo Minsk man had it in him to excel in this role. This had also been where he'd performed during his only effort hitherto in the qualification, in the 2-0 home win against Austria. Whereas the central midfield three had already been accounted for, it must also be said that Gennady Litovchenko's role as the right-sided alternative was another highly vital position for the hosts. He was one of two ever-presents thus far, and he was indeed also their leading scorer, having notched three times from seven games. Litovchenko was such an enigma along his flank, also very capable of coming inside to participate in any attacking plan which the hosts may have been pondering. The 26 year old Dinamo Kiev man, making his 50th international appearance on the night, is the first to have an effort goalwards, although his first time strike just after the ten minute mark is too high to cause Turkey 'keeper Engin any concern. Litovchenko had seized on a headed clearance from Turkey libero Gökhan, after Yaremchuk, Litovchenko's flank counterpart, had put a cross into the centre. Yes, Yaremchuk. The small, fleet-footed winger had been thrust into the side, perhaps somewhat surprisingly. He had been part of the Soviet team during the 1986 World Cup, where he'd made three appearances and scored once. However, loss of form had left him out of the squad for the 1988 European Championships. Now, he was in the line-up in order to provide some needed width along the left hand side, and he would be seen on the ball with great frequency early on. He might not have gained a lot of personal luck in the early exchanges, but his inclusion made the Soviets look distinctly more unpredictable than had been the case recently. There was a positive aura about them, and so it was left to see whether it would last. Speaking of disappointments: Star striker Oleg Protasov had been one. This was his eighth start from eight in the qualification, though his return of a sole goal was a massively unsatisfying one. He had shown glimpses of his great quality, though too often had he been found too static, not shifting about enough in his lone striker's role. It should also be added that he had been lacking in support on a number of occasions, so at least partially there were others, too, to blame for his disappointing return. He had done relatively well in the away fixture against the Turkish, and so he would be hoping that their more attacking outline this time around would see him rewarded. He did look to have Turkey defender Kemal Serdar tied to him. The game is flowing well, even if little is created in terms of goalmouth action. The visitors are clearly attempting to keep a tight defensive until they can work out how the loss of three main figures will influence on their strategies, and it does appear that they are particularly lacking in midfield quality. Not so strange, considering that Ünal, possibly their best and most consistent performer so far in the qualification, is missing. However, they are yet doing an alright job in keeping the Soviet Union at bay, even if it is not the most difficult task in itself. The hosts might be improved on previous performances, but they still struggle to find that fluidity inside the final third of the pitch. There does appear to be a moment a couple of minutes after Litovchenko's wayward shot, but when Protasov heads Luzhny's cross from the right into the path of Zavarov, the ball falls to the attacking midfielder's right foot rather than his prefered left (although he is arguably capable with both), and once he takes a touch to steady himself, recovering Turkish defenders make sure he's already wasted the opportunity. Gradually the Soviets are building on their advantage in possession, slowly increasing the pressure on the visitors, and just after 15 minutes, they progress along the right hand side when Luzhny feeds Litovchenko along the channel. The wide midfielder makes it to the byline, from where his cross is punched away by Engin, who is called into action for the first time. Protasov had been lurking right underneath his fist. The Soviet combinations are becoming more effective, and the early Turkish pressure on any player in possession is receding. If it continues along these lines, it does seem to be a matter of time until the Soviets are able to carve the visitors open. Another two and a half minutes after Engin's punch, there are further tendencies in the hosts' play, when some trickeries by Yaremchuk appear to lead nowhere, until he is fed the ball back by Dobrovolsky, and when his cross reaches Mikhailichenko, the match winner in the reverse fixture, the midfielder is given the chance to turn and shoot from a central position inside the area. However, like Litovchenko's earlier, his left foot effort clears the bar by some margin. Turkey can draw another breather. As for the Turkish, they have arrived in the Soviet Union clad in a 4-4-2 formation. This was the first time they had returned to 4-4-2 since the 3-2 defeat in Vienna, but again it must be seen in light of their major absentees. It was no way they could attempt playing their usual game without those mentioned key performers, and they needed to adapt, trying their best to build a sound defensive base from which to work. Their aim must have been to keep a clean sheet until half time, and then perhaps come out in the second half in a somewhat more attacking shape. They had been 3-5-2 last time around, and they had arguably played their best games in this qualification with three players in the centre of the pitch. Between the sticks was Engin İpekoğlu, whose inclusion went without saying. He had come in and filled the vacant goalkeeper's position following Fatih Uraz' highly tragic circumstances, and he'd almost single-handedly won the Turkish both points with his immaculate performance in East Germany. Vitally, the Turkish had needed to look for a replacement for suspended skipper Cüneyt Tanman. The central defender had played a major part in the qualification thus far, appearing so assuredly at the back, where he had started off as a libero, although he'd been moved into a man-marking capacity soon enough. However, the moustached Galatasaray man, by now 33 years of age, was far from your typical marking central defender. He had a lot of ability on the ball, and would often be the one instigating an attack from the back, carrying the ball across the halfway line. This ability seemed to be missing with his successor, Trabzonspor's Kemal Serdar. Making his first playing appearance of the qualification, Kemal turned out in a distinctively more customary man-marking role than Cüneyt, sticking as tight to Protasov as he could. Behind him was the by now traditional libero Gökhan Keskin, still only 23 years of age. The Beşiktaş defender had certainly come of age during the qualification, and he had left an excellent impression. The leadership qualities of Cüneyt would surely have benefitted him. Still, he was capable of playing well even without the guidance from the regular skipper. Gökhan was excellent in the air, and he was another player well capable of mounting from the back, as well as reading the game soundly. Along with Gökhan, tonight's full-back Semih Yuvakuran was the sole Turkish player not to have missed a single minute of the qualification. Semih had, perhaps a little surprisingly, been placed in the heart of the defence during the win against Austria last time around, having played left-back in their previous six games of the campaign. He was back at full-back on this occasion, and would time and again be up against the Soviets' Litovchenko. Opposite of Semih was the returning Recep Çetin, whose only omission during the qualification had been due to his suspension last time out, when Rıza Çalımbay, a team mate of his at Beşiktaş, had filled in for him, albeit at wing-back rather than as a traditional full-back due to Turkey's 3-5-2 shape. Recep was once again giving his typical dependable impression as the right-sided defender, and not offering a whole lot going forward. The four Turkish players in midfield were, from right to left: Hakan Tecimer, Rıza Çalımbay, Oğuz Çetin and Mustafa Yücedağ. The latter had played a very fine game against the Austrians as the more defensive of their three in the centre of midfield, and he had steadily grown into their team as the qualification had progressed. Mustafa certainly had some excellent qualities on the ball, and even his battling skills were not to be denied; he had a certain level of aggression about him. However, out along the left hand side, he had lived a largely anonymous existence thus far. He seemed to be wasted in that role, although it was clear that the central defensive role, the midfield anchor man position in their 4-4-2, demanded other qualities from a player than what had been necessary as the holding man in that 3-5-2 formation versus Austria. Now, it was Rıza's task to bolster up the back of the Turkish midfield. He had come through with flying colours as an attacking full-back in that 3-0 win, and would have to adapt to a totally different kind of role on this occasion. He had also seemingly been instructed not to wander too far away from Zavarov, whom he was almost shadowing. Ahead of Rıza in the centre was playmaker Oğuz. The 26 year old from Fenerbahçe was yet another who had risen to the occasion during the qualification, often giving high calibre displays in midfield. He had been the central and more defensive man in a trio on a couple of occasions, but his strength clearly seemed to lie in the attacking half of the pitch, where he could use his excellent vision and good distribution. Oğuz had often combined well with the missing Ünal and not least his Fenerbahçe team mate Rıdvan, but in the absence of both Ünal and also Uğur on this occasion, a whole lot of creative responsibility fell on his shoulders. He saw much of the ball, though the visitors were vastly inferior in possession compared to the hosts. To complete the midfield was right-sided player Hakan Tecimer, who had featured as a front-runner during the 2-1 loss in Iceland. That had been Hakan's debut at international level, and perhaps did his inclusion on this occasion seem a tad strange considering he'd not done much above the ordinary in Reykjavik? He was someone of relatively light frame, something which could spell trouble against physically very adapt Soviet players. He appeared to have decent close control, but he would rarely stick to his wide position, often seeking inside to assist his central midfield. This could well have been according to instructions from the management, of course, but it often left their right hand side inactive, something which had to be compensated for by the two strikers. Up top were Rıdvan Dilmen and Feyyaz Uçar from each their Istanbul giant. They had both scored three times from Turkey's first seven qualifiers, and so they did have someone with the ability to stick the ball in the back of the net despite the loss of form by leading scorer Tanju. Rıdvan was wearing the captain's armband tonight, and Turkey would need every ounce of quality from his body. He was an unpredictable character well equipped to pose a threat, both through wily runs along the channels and through an ability to pop up behind the back of a defender in front of goal. He would orchestrate a tandem with Feyyaz, who was also capable of carrying the ball at speed, and definitely also with conjuring up goals. Tanju had perhaps scored more frequently than both, but on the ball, both Rıdvan and Feyyaz had shown at least as much as Tanju in terms of quality in the current qualification. Despite the Soviets' advantage in possession, they are yet unable to put Engin to the test. 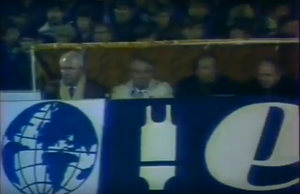 In fact, the goalkeeper's only had to intervene from Litovchenko's right wing cross so far, so even if the USSR are giving a more positive display than we've seen recently, they do find it difficult to break the visitors down. They are moving well in midfield, where players are constantly swapping positions, and even if the blonde Mikhailichenko has initially held the deepest of the three central midfield positions, it has typically been him who has arrived at their best opportunities yet, even if he's failed to hit the target. This includes his latest effort on 26 minutes, as he's been fed a short ball by Dobrovolsky just inside the area, almost in an identical spot to where he had failed to hit the target for his earlier shot on the turn. Dobrovolsky had shown some tenacity in winning the ball from Rıza just outside the Turkish area, but once again finding the goal frame had eluded the hosts. 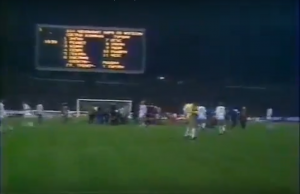 A few minutes earlier, some rare confusion had arisen down the other end of the pitch, when Semih had won the ball from Luzhny to the left outside the Soviets' area. His cross had been too high for Dasayev to claim, though it had dropped for Khidiatullin to head away, although into the path of his own goalkeeper, who had failed to secure the ball. It had not brought any immediate danger to the hosts' goal, but at least it had shown that the USSR were susceptible of erring at the back. Just shy of the half hour mark, there's a first booking of an otherwise fair contest. Oğuz has emerged ball at feet from a midfield scrap and played a crossfield pass to his captain Rıdvan, who is cynically kicked to the ground by Gorlukovich, the Soviet left-back. It is probably not so that Gorlukovich has any wishes to try and harm Rıdvan, but it is as blatant a yellow card as you'll see; the referee's absolutely spot on. The forward is soon back on his feet again, and there appears to be no ill blood between the two in the aftermath. With around 26 minutes on the clock, just when Mikhailichenko's had skied his second effort from inside the area, the stadium PA system had announced that Austria had moved ahead against GDR in the other game in this group, taking place simultaneously in Vienna. Should either side win in Austria, Turkey would need to equal that effort here in Simferopol. Even if the travelling Turkish contingent did not know Russian, it is likely that they were well informed of events in the other tie, and so they were beginning to realize that perhaps even a strong draw in Crimea would not be sufficient to take them through. However, the team needed to see the first half through until they heard what their manager had to say. There was no change in the game picture once the message of Austria's goal had been bandied about. Around ten minutes later, the tannoy announces a further Austrian goal in Vienna, and if the visitors here inside Stadion Lokomotiv hadn't realized it already, they were by now eyeing an uphill battle: They'd need to perform a miracle no other nation had ever managed in a qualifying tie in these parts of the continent behind the Iron Curtain if they were to make it through to next year's World Cup. The home side had looked to be in the ascendancy for most of the half, but some earlier impetus had failed to bring about much in terms of goalscoring opportunities, and defending their goal had largely been a manageable task for the Turkish. Kemal was still sitting tight to Protasov, whose desire to make runs into the channels had seemed to die down, whilst Rıza kept monitoring Zavarov's movements, thus rendering the Soviets' Italy based ace slightly ineffective. There was more initiative from the other inside midfielder: Dobrovolsky had seemed to revel in a more central position. However, since the Soviets had collectively gone off the boil a little, he too had been more quiet in the last few minutes. He would sometimes seek to engage himself along the left hand side, perhaps as a result of having played wide left hitherto in the campaign. Interestingly, their designated wide left player, Yaremchuk, had at times come across to Litovchenko's right hand territory, where they would try to outnumber the visitors. It had yet been of little success. The final few minutes do not contain any explicit material, although the hosts will yet again arrive at an opportunity through Mikhailichenko. When on song, the Dinamo Kiev ace was right up there among the world's best midfield players, but so far in the qualification he had not quite managed to live up to expectations. Not that he was alone in this USSR select. However, he'd won the Soviets the tie in Istanbul, and he had repeatedly come the closest to scoring during this first half, too. Now, accepting a headed clearance by Kemal from another Litovchenko right wing cross, Mikhailichenko could strike low with his left foot from just outside the area. This time he managed to keep his effort down, but Engin was again well positioned, and despite the midfielder getting decent power behind the shot, it did not duly worry the stopper, who claimed it well. The West German referee had had a comfortable game to officiate, and he decided to bring the first half to a close with a couple of seconds to spare. 0-0 as the teams trotted into the dressing rooms for their 15 minute break. Vitally, Austria were 2-0 in front against East Germany in the other fixture. The fact that the surface seemed a bit heavy meant that there had probably been certain amounts of rain passing by Simferopol at some stage or stages during the last few hours before kick-off. This could well have contributed to the players tiring somewhat towards the latter and less eventful phases of the opening period. Could the slightly lighter Turkish players gain advantage from this and surprise their hosts during the final 45 minutes? There had been a change in the Turkish line-up, with the disappointingly anonymous Mustafa having left the field of play in order to be replaced by Metin Tekin, who was making his second substitute appearance of the qualification, albeit his sole previous cameo had been a very brief one as he'd only come on right at the end of the excellent 3-0 win against the Austrians. What did this mean to their formation? Any changes? We have no pictures from the kick-off itself, but it would've been performed by the visitors, as it had been the Soviets kicking the opening half into action. The visitors deserved praise for their tactically well performed first half, in which they had contained the Soviet Union without too much bother. At some point in the second half, though, they would most likely have to come out from their shell and attack the hosts, something which would surely open a whole lot of space for the counter-strong hosts to exploit. The early second half passages of play are somewhat apprehensive from both parties, who are identically careful not to throw too many men forward simultaneously. The Turkey players had been true to their positions throughout the opening half, with Rıza not straying away from his holding midfield role, in which he also had the added responsibility of looking into Zavarov's actions. Oğuz ahead of him in the centre of the pitch had also gone through a lot of work off the ball, something which was hardly their playmaker's strongpoint, and they would wish to let him in possession in order to muster something in the attacking end of the pitch. They appear cautious also at the start of the second period, with neither of Oğuz, Rıdvan or Feyyaz much in participation. At the back, Recep still needs to tussle with Yaremchuk, who is holding his left hand attacking side well, while the Protasov v Kemal battle is still prolific in the centre. Gökhan continues sweeping behind his fellow central defender, and he executes a tackle on Zavarov almost on the byline to the right inside his own area when the diminutive Soviet playmaker tries to take advantage of a loose ball. It had been a slightly daring tackle, but Gökhan once again came through with flying colours, seeing the ball out for a left wing Soviet corner, which would be dealt well with by the secure hands of Engin just on top of Mikhailichenko's head. The very same goalkeeper had also showed a safe pair from a diagonal Zavarov drive a couple of minutes earlier. Mikhailichenko had been the one player to arrive at the most opportunities during the first half, even if he was originally sitting in the deeper of the three midfield roles. With no typical defensive midfielder in their eleven, one could've thought that the Dinamo Kiev star would have his work cut out inside his own half of the pitch, but with Turkey still very careful in their approach, there had been plenty of chances for Mikhailichenko to come forward, popping up behind his more advanced midfield colleagues Dobrovolsky and Zavarov. The trio had shifted about well during the first half, or at least inside the opening half hour. 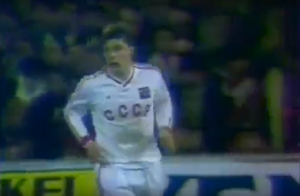 They had contributed to that attacking unpredictability which had gone missing for the Soviets over the last few qualification matches, and in fairness, Mikhailichenko's three attempts during the first 45 minutes could easily have brought the opening goal had his shooting been more precise. Dobrovolsky was looking to either play in striker Protasov or orientate himself towards the left hand side of the pitch, where he could engage with the tricky Yaremchuk, who was occupying right-back Recep along the touchline. 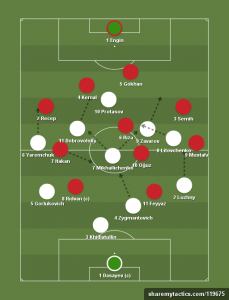 Turkey were forced to sit deep not to give away too much space in the territory between Recep and their central defenders, although Gökhan would be alert enough to any danger coming this way, exemplified through his perfect tackle on Zavarov five minutes into the second half. The Turkish had been patient all evening, and their efforts could've been rewarded as they were awarded a free-kick in a fine position on 58 minutes. 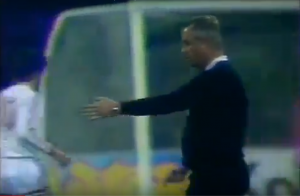 The Soviets had not been able to properly clear their lines following a Turkey right hand channel free-kick awarded to substitute Metin, who had been obstructed by Gorlukovich. Rıza had hit it into the centre, and though it had initially been headed away by the Soviet left-back, the Turkish had managed to retain the ball in advanced areas, and the somewhat inexperienced Luzhny had come to bring Rıdvan down in a fine shooting position just outside the area as the visitors saw it. This was their first real opportunity to have a go at Dasayev's goal, and their captain for the occasion makes the goalkeeper work: Rıdvan is able to bend his right-footed free-kick around the defensive wall, but Dasayev covers his corner well, although he concedes a rebound which goes straight out to midfielder Hakan. However, from a difficult position inside the area the Turkey number 7 gets way too much air under his shot, which clears the bar by some margin. The threat is gone. It had proved to the visitors that testing the hosts was still not beyond them, though. As things were going elsewhere, they would certainly need to try likewise again to get that elusive win which would see them through, even as group winners. When Metin had arrived for the start of the second half, taking the place of Mustafa, it had meant a reshuffle in their midfield and in their formation, with Hakan, who had been their right-sided player during the opening half, moving across to an inside left position. Hakan had needed to operate a whole lot in field in order to provide another body in central areas for the opening 45 minutes, when the Soviets had been numerically superior in the middle of the pitch. Now, a move into the centre appeared to be of more permanent nature. Metin, though, would clearly be playing in a wide right role for the second half, where he would engage Gorlukovich in battle. Hakan had rarely been able to provide much in terms of attacking threat before the break, and Metin did seem a step up. However, after what quality Mustafa had shown earlier in the qualification, it did seem strange that Hakan had been allowed to remain on the pitch in his place. For all we know, there could well have been other reasons for Mustafa's departure, as he had looked eerily bleak during the first half in that wide left role. Feyyaz seemed to drop into a wide left position for the early parts of the second half, leaving captain Rıdvan more or less a lone striker up front. It was time for a reintroduction of 4-5-1, at least for the time being. Turkey would need a goal or even goals, but they could afford to be patient still, and they were probably hoping that frustrating their hosts was the way to go about it. With the second half approaching its midway stage, there are some truly decisive moments both here and in Vienna. As Engin catches a Zavarov left wing cross, we hear from the tannoy that the game in Austria is all but over for the visitors, who now are 3-0 down. It is clear to Turkey that they will not receive any help from elsewhere, and so they must find that goal themselves to win through to the World Cup. However, rather than causing much in terms of trouble in front of Dasayev, other than that earlier free-kick, they see Dobrovolsky run towards the byline with the ball at his feet, and though the attacking midfielder is able to get away what seems in equal terms a pop at goal and a desperate cross for any team mate to get at the end of, the ball rolls harmlessly in parallel with the Turkish goal line behind goalkeeper Engin and can be cleared eventually. Only moments later, the visitors are not so fortunate. Again Dobrovolsky is instrumental, as he feeds Yaremchuk a low ball forward inside the left hand side of the Turkish penalty area. The winger makes it to the byline, from where he pulls the ball back 45 degrees, just according to any text book. There is Protasov to take advantage, and the striker, who's had a decent shift on this occasion, can side foot the ball high into the back of the net behind an exposed Engin. The Soviets are in front, and so both their passage through to the World Cup as well as the group victory appear to be near. It will take two Turkish goals to wrestle the USSR down from the throne, so Protasov's second goal of the qualification would've been celebrated in equal measures both here in Stadion Lokomotiv and in Vienna. In the next four minutes after the goal, it is as if the Turkish are abandoning all of their principles of work ethics, as they are close to surrendering. They see the home players, buoyed by the goal, swarm all over them, and the Soviets line up one chance after another. Mikhailichenko is yet again in the thick of the action as he makes it through the centre of the area until he is foiled by Engin, only for the midfielder to be given a second opportunity, when he spins and shoots left footed from close range, only to be denied again by the goalkeeper, who's done terrifically well to redeem himself and recover in time to save. Less than two minutes later, Mikhailichenko, yet again, pops up in a shooting position outside the area after some fine Soviet combinations, but he's probably already read tomorrow's headlines inside his head, and as soon as he took his eyes off the ball, his left footed shot sliced off his boot and went harmlessly to the left of goal. Just half a minute later Protasov is allowed time to thread a ball through for Zavarov to run onto in the centre. However, Engin comes out and makes the advanced midfielder rush to toe-poke his effort over. Another decent piece of decision-making from the 'keeper, and another chance which went begging for the hosts as they were threatening to run riot. The 3000 or so strong travelling band of Turkish football fans probably had few hopes of a miracle by this point, although these waves of Soviet attacks would wear off without the concession of further goals. As the visitors had pieced their act together again, they gave it another go inside the hosts' half of the pitch, and Semih came trotting forward to bring a free-kick in an attacking position as well as a yellow card for Soviet right-back Luzhny, who had felled the Turkey left-back. Luzhny had escaped any further retribution from the referee when he had brought Rıdvan down for that earlier free-kick, and he had also conceded another free-kick for a foul on Hakan recently. The yellow card seemed to have come as a result of accumulation, and perhaps not so much due to the foul of Semih alone. Before Turkey would proceed with the kick, they made their second and final substitution for the evening as Tanju replaced the ineffective Hakan. It did not seem to matter so much at this stage what formation the Turkish would see the game through in: It could be 4-4-2 or it could be a continuation of 4-5-1, with Feyyaz moving inside somewhat to take up Hakan's midfield position. The nine times capped Beşiktaş striker had either way not had too much influence on proceedings. There is at last some urgency, almost desperation, among the Turkish now in their attacking attempts. The nature of the game sees them earn some moments of possession inside the Soviet half, and it does seem so that Feyyaz is by now reluctant to remain in the wide left position. However, Tanju has taken up position in the centre since coming on, so left hand side territory is where Feyyaz must remain, albeit somewhat more advanced than from the start of the second period. With the latest addition to their side being their most natural goalscorer, there had been few questions as to his whereabouts. Tanju was accompanied by Rıdvan, who had worked hard all evening, but who had enjoyed little luck. And when he tries to take the ball beyond Khidiatullin to the right outside the Soviet penalty area, the home libero is able to get his foot to the ball and boot it away in the forward direction, where Protasov can pick it up on the halfway line and dart towards the visitors' goal. He's closely tracked by Gökhan, who however never manages to get a tackle in until the striker attempts a toe-prod past the advancing goalkeeper. The ball ricochets off Engin and back into the hip of Turkey's libero, and there's nothing Gökhan can do to prevent it from rolling agonisingly across the goalline for a second Soviet goal. With just over ten minutes to go, this appears to be the end of Turkey's World Cup dream. What happens in the trail of that second Soviet goal appears unimportant. Both sides know that the game, and indeed the qualification, are over, and so there's not much to do but to play out time. Turkey had indeed brought Tanju on in the centre-forward position, keeping Feyyaz towards the left and Rıdvan somewhat to the right in a formation akin to 4-3-3, although numbers combinations seem immaterial at this stage. Tanju makes a half-hearted plea to the referee to award them a penalty when an Oğuz cross from the left seems to strike the hand of Gorlukovich in the centre before the left-back makes a clearance. The hosts then see Dobrovolsky swing a deep cross over from the left. It had in fact been hit so deep that the Turkish players thought it had crossed the goalline, only for Protasov to gather it as it came down to the right inside the penalty area and lay it off for Litovchenko, who was allowed a go from a difficult position. His shot was wayward. Not that it mattered much. Next up were a couple of Soviet substitutions, when Dobrovolsky was first withdrawn in order to accommodate Fedor Cherenkov. The Spartak Moscow playmaker would get the final few minutes of the game in an advanced midfield position, something which could've suited him really well in ordinary circumstances. However, the game was no longer a proper contest, with neither side truly interested in mounting attacks. Less than a minute after, it was young right-back Luzhny's time to exit, as he was replaced by Vasily Rats, who had not been on the pitch for the national team since the 0-0 draw in Austria. Rats came on at left-back, moving Gorlukovich across to occupy the right-back berth in the remaining few minutes. There's a couple of further goal attempts from the hosts. Protasov gets a fine header at goal from Litovchenko's delightful right flank cross, but goalkeeper Engin is equal to the striker's effort as he pushes it over for a right wing corner. Later, Cherenkov proceeds into a shooting position with his right foot from just outside the area, though a minute from time, he is unable to keep his effort down. There is to be no further action in any telling position, and so, just shy of a minute into added time, the referee brings the game to a half. The Soviet Union have defeated Turkey by two goals to nil. The visitors approach the match carefully, and sit deep in order to soak up whatever pressure it is that the hosts wish to heap upon them. The hosts dominate possession, though Turkey's tactics appear clever in the circumstances, as they're without several key performers. There was no way they were ever going to attempt the free-flowing attacking brand of football for which they'd become known during the qualification. They limit the Soviets to a few shooting opportunities from Mikhailichenko during a first half which is a decent spectacle, in which the Soviet Union are much less of a predictable entity compared to their three most recent qualifiers. After the break, the hosts up the pressure, and when they move in front through Protasov's side-footed finish, coupled with a third Austrian goal in Vienna, it is all but over for the visitors, who now need to score twice. They finally push men forward, but are caught by Protasov on the break for the second, which comes off Gökhan before going into the back of the net. And that is just about it. The Soviets win the group; the Turkish are out. relished a more central role, and showed some fine play in combinations with his attacking colleagues. Played his part in releasing Yaremchuk for the opening goal. Positive display!